The Bears Pit: Favourite Mercs & NPCs » Steroid Gontarski has terminated all ze evil peoples! Home » SIRTECH CLASSICS » Jagged Alliance 2 » Favourite Mercs & NPCs » Steroid Gontarski has terminated all ze evil peoples! "DAMMITTOHELL! I zaid lay still!" Putting in the work Cagemonkey , have you thought of doing new load screens ? Scenery , night-times etc. , would be nice to have different views while loading . No. But it might be cool to do. Right now I have to struggle with my eyes after my LASEK. 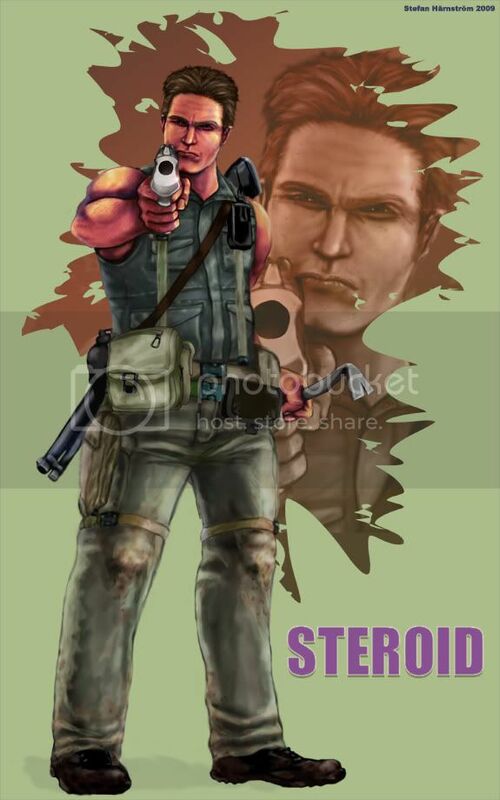 I was able to finish Steroid despite my dim vision! How about doing Red and Devin next? They should probably be in one picture. I'm sorry that I "borrow" your thread, but I think it's the right moment for a little public "Thank you!" Your updated \BIGFACES for the PCM+ miners looks absolutely amazing! Thank you for answering my mail, your hints and your pictures of course! Glad you liked them. Put them to good use! Maybe I should do more in-game stuff? Too bad I have to work and eat and watch Dexter! Many thanks for your "Spooky" files! Glad you liked them. Put them to good use! To quote Mr. Rothman: "It was a pleasure!" OMG, wow! Outstanding work. That is spot on for Steroid. I think it would be killer to have full-body portraits for each merc in the SMP. Heck, I'd be the first guy to chip in on a donation fund to keep you working, Cagemonkey. P.S. Shadow would be my next vote. Shadow has already been done. You know, I had figured you might say that, and lo, there he was, one of the first threads in this forum. Previous Topic: Mercs in relationships? Next Topic: The funniest MERC?